Dear Office-Politics is the award-winning dilemma-based social game that teaches you how to play (and laugh at) office politics. In March 2010, it won a bronze Axiom Business Book Award in HR/Training. Each ethical dilemma is based on an actual letter that was submitted to OfficePolitics.com since it was founded in 2002. 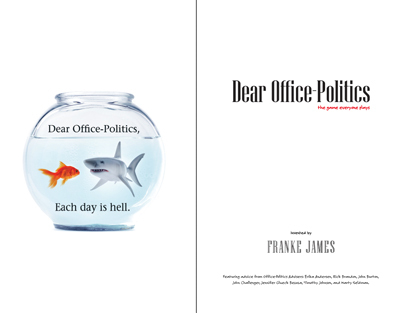 Dear Office-Politics was invented by author and site founder, Franke James. It features replies by Office Politics Advisers: Erika Andersen, Rick Brandon, Ph.D., Dr. John Burton LL.B. M.B.A. M.Div. Ph.D., John A. Challenger, Jennifer Glueck Bezoza, Franke James, Timothy Johnson, and Marty Seldman, Ph.D.
Franke is an author, artist and speaker on social change and the environment. She is the author of Bothered By My Green Conscience, an award-winning graphic novel about her journey to go green. Franke is co-founder of The James Gang Art & Design and Nerdheaven Ltd., with over 20 years experience as a creative design professional. She has a Masters in Fine Arts from the University of Victoria, and a BFA from Mount Allison University. 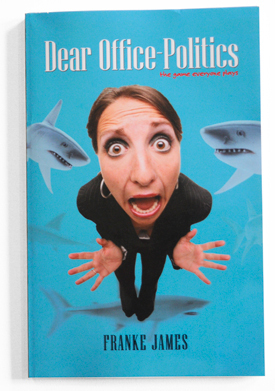 Dear Office-Politics gets people thinking about culture and the importance of fitting in. © 2000-2015, Nerdheaven Ltd. All rights reserved.